Below is a list of backgammon clubs in Belgium. Feel free to write or call the local club responsibles for more information. All of them are nice people looking forward to meeting you and introducing you to the players in their club. Click on the name of the city to go to the club’s website, if it has one. Most clubs organize weekly or monthly events. Depending on the number of players that show up, a little tournament is organized or people just play some friendly matches. Participation is usually for free or at very low registration fees. The club events are open to everybody, non-members too. An email or text message to the organizer to announce your participation is well appreciated, of course. Most players bring their own board, but you’re welcome without equipment too. Players in Gent meet weekly on Tuesday evening, those in Hasselt on Wednesday evening and those in Brugge on Thursday evening. The Brussels club organizes the Brussels Friendly tournaments on the first Friday of each month. 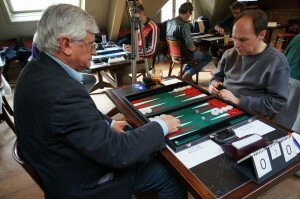 The Backgammon Club Leuven hosts the monthly Fourth Friday tournaments. The club in Antwerp is one of Belgium’s oldest, and it hosts the Antwerp Open tournaments in September. Other yearly events organized by the clubs are the Brugge Backgammon Day (February), the Gent Open (March), the Brussels Backgammon Day (October) and the Leuven Open (November). All backgammon clubs in Belgium are warmly invited to join the federation. For a club to become member of the federation costs 10 euro per player that the club wants to register. In return, players receive a rating, and the club and their players can participate in the activities of the federation, such as the 4 Cubes interclub competition, the Belgium Individual Championship and the Backgammon Master Series Belgium. Perhaps you don’t feel like a club yet but just a group of friends playing backgammon from time to time? Excellent! That’s how all clubs started. Just write us, and we will help you take the next steps. If you know of a club that’s not listed below, please let us know at jjjsegers@gmail.com.